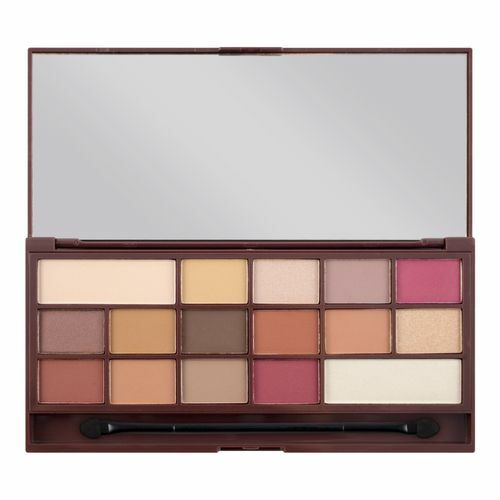 The Chocolate Elixir Palette by Makeup Rrevolution has a beautiful mix of 16 matte and shimmer eyeshadows ranging from neutrals to warm, long wearing, highly pigmented shades, that are easy to apply and soft to blend. Shades that will compliment and draw attention to your eyes. Encased in a beautiful matte rose gold chocolate bar palette with full size mirror. 16 sunning matte and shimmer shades. Explore the entire range of Eye Shadow available on Nykaa. Shop more I Heart Revolution products here.You can browse through the complete world of I Heart Revolution Eye Shadow .